Getting a buttery smooth tracking shot requires special camera gear, like a Steadicam rig. It also requires a skilled operator, very unlike the man in this video. 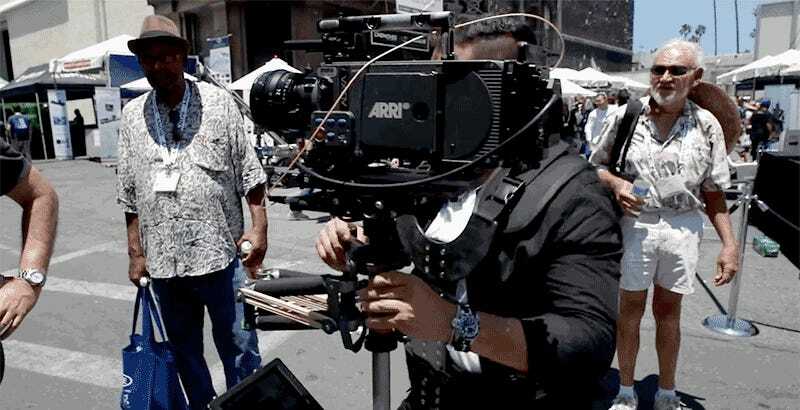 Demonstrating a stabilizing rig at the recent Cine Gear Expo in LA, he failed to keep a secure hold on the Arri digital cinema camera it was supporting, resulting in an incredibly expensive mistake. The camera that succumbed to gravity appears to be an older Arri Alexa model, but it still costs tens of thousands of dollars when purchased used. And depending on the lens and other accessories attached, it can be worth upwards of $100,000 when fully configured for a shoot. Adding insult to injury, because this camera wasn’t being used during an actual film shoot, it probably wasn’t covered by any kind of production insurance. And as far as demos go, who wants to buy a stabilizing rig where the camera can end up kissing concrete?